organic lemons, star anise, cardamom, cinnamon, cloves, ginger, etc. However, my 10, 12, and 14 year old all came down very ill. I had the beginning symptoms. My 14 year old and I took more of our usual preventative "medicines," but they just wouldn't work. I have been studying herbology (herbalism, herbal medicine) for about 6 years now off and on. Technically, when I was the front office manager and performed some Physical Therapy for a Chiro-Orthopedic was my first venture into using natural means to achieve wellness, about 20 years ago. My boss/doctor taught me how to use acupressure to control my asthma. It worked better than my inhaler (which I gave up). He taught me a decent bit about using natural cures instead of prescriptions for various ailments. Our patients who stretched held their alignments. Those who didn't came to see us again a few months later in pain needing an adjustment. Anyhow, I decided to make up a couple of cold/flu immune booster syrups out of things I had in my cupboard/fridge. I started taking about a Tablespoon of each three times a day and guess what? Yep, I was able to fight off this nasty sickness while it was just a tad bit of a sore throat and sinus drainage. Those symptoms went away and I continue to take it. And I am fighting other diseases on top of it, so my body's immune system is shot right now. Let me tell you what I know about the ingredients I used in these two syrups. Star Anise (Chinese): Did you know this spice has shikimic acid, which is the ingredient they use to make Tamiflu? It can help fight viruses, bacteria, yeast, and fungi. It's been used by some to treat respiratory tract infections, bronchitis, and various strains of the flu. Cardamom: This spice is known for fighting common colds, bronchitis, sore throat, and helping to prevent infections. It is also both a great digestive aid, and for urinary issues. 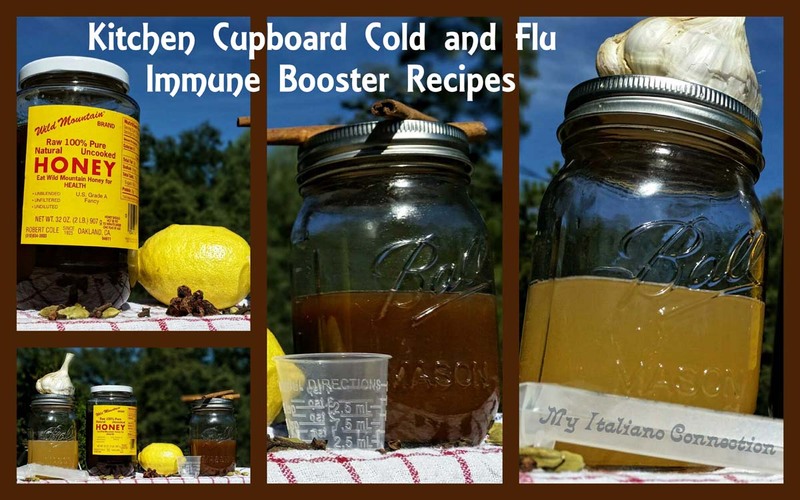 Cinnamon: It is often part of a combo to fight the common cold. Of course it is useful in treating blood sugar issues, digestive issues, and even high blood pressure. Ginger: It is helpful when used in combination with the above spices for dealing with upper respiratory tract infections, common colds, and bronchitis. Ginger is well known for its digestive comfort, too. Nutmeg: Can help with fighting bacteria and fungi, pain, and digestive issues. However, go easy on the nutmeg, as too much can cause hallucinations and some other issues. It is perfectly safe in normal usage. Raw, local honey: Used to treat seasonal allergies, asthma, and building the immune system. It is known to be an antiviral and antibacterial agent. Raw garlic: Works on the cold, flu, asthma, bronchitis, but also builds the immune system to fight bacterial and fungal infections. There is some evidence that it can kill bacteria such as E. coli, antibiotic-resistant Staphylococcus aureus, and Salmonella enteritidis. So without further ado, let me give you the two amazing recipes! First one is Culinary Spice Cold and Flu Immune Booster Syrup and the second is my Garlic Honey Cold and Flu Immune Booster Syrup. *NOTE: No matter what anybody else tells you, DO NOT BOIL, COOK, OR BAKE THE GARLIC! Same with the honey. You will kill the healing ingredients if you do. Bring water to a boil and pour into a small mixing bowl. Let sit for a few minutes until it is hot, but has cooled down some. Add the lemon zest (not the juice yet), star anise, cardamom, cinnamon, ginger root, and nutmeg and stir well. Cover with a plate and allow to sit somewhere warm (I place it inside my oven because my pilot light keeps my oven between 90-100 degrees) for about an hour (more if you'd like). Stir again and pour through something like cheesecloth layered several times in a strainer or a nut milk bag, into a pint jar. 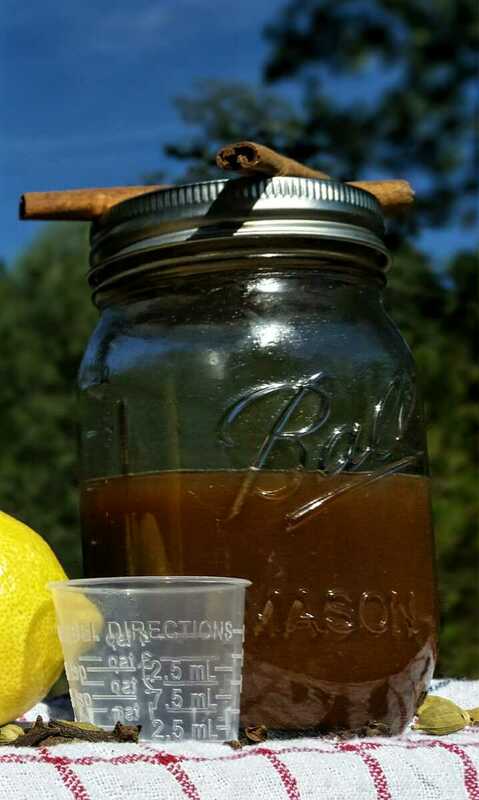 When at room temp add honey and lemon juice and stir well. Label and place in fridge. Shake well before using. Adults can take 1 Tablespoon 3-4 times daily, followed by some water. Children would take less, depending on size. Bring water to a boil and pour into a small mixing bowl. When it cools down a bit, add lemon zest. When it reduces in temperature to 90 degrees, add minced garlic (including any garlic juice). Cover and let sit for at least one hour in a warm place (I place it in my oven, because my pilot light keeps my over between 90-100 degrees). 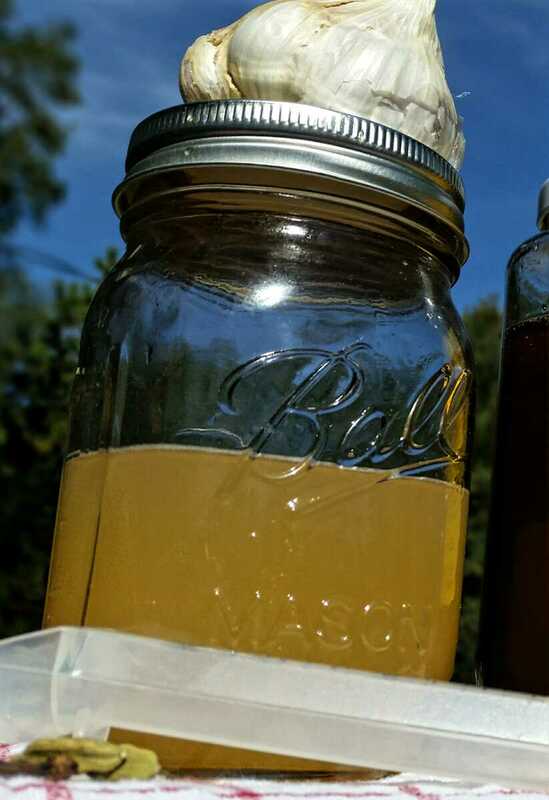 Strain the mixture as you pour it into a pint jar. I use a nut milk bag, but you can use a strainer with several layers of cheesecloth, too. When mixture reduces to room temperature add the lemon juice and honey. Stir until well mixed, then refrigerate. Shake well before using. Adults can take 1 Tablespoon 3-4 times daily, followed by some water. Children would take less, depending on size.